Although asking about the price of an internet presentation without any specification of what you demand may be very tricky because the price may differ significantly in individual cases, this page inlcudes a list of prices that you may expect to be charged. 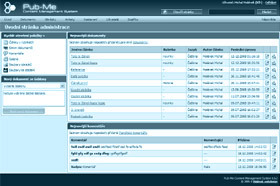 The basic module is necessary for functioning of Pub Me Content Mangement System. The basic installation of the system includes the following modules: documents, templates, language versions, sections, galleries, administrators, users, settings, file manager, export to static html. * 1 license is valid for 1 website on 1 domain (except of multilingual websites using more domains on basis of a purchase of Multiple domains add-in). Unlike the above mentioned price list, which it is possible to prepare pretty exactly for any order, these works may significantly differ in individual cases because each realization requires a different amount of work. Although it is possible to say, so you could have a rough idea of what it is going to cost, that creation of a complete website using Pub-Me CMS starts at about CZK 40,000* (about US$ 2,000–2,500 depending on the current exchange rate), this information is very simplified, almost misleading. We are able to create a Pub-Me CMS based website for less but it is not ruled out that it will cost singnificanlty more - everything depends on specific requirements. * This is a rough price estimation for a complete website including a license, excluding a graphics design (about CZK 6,000) and programming of custom functions.